"Hanifi Traditionalism: An Alternative to Salafism in Chechnya." Session A18-30 (Contemporary Islam Consultation), Saturday - 9:00 am-11:30 am. Both papers to be given by Mark Sedgwick. If you prefer to read in Serbian, Against the Modern World is now available in that language, as Protiv modernog sveta: tradicionalizam i tajna intelektualna istorija dvadesetog veka by Mark Sedžvik (Belgrade: Ukronija/Biblioteka Vrhovi, 2006; 377 pages; ISBN 86-84807-17-0). During the late Soviet period, one of the most important Russian ultra-right movements was the Brotherhood of Tsar Nikolai II. Since 1991, three of its main figures have been active on the fringes of Russian Traditionalism. The Brotherhood’s former leader, Alexei Shiropaev, moved through the circles of Alexander Dugin and Edvard Limonov to pro-“Orange” neo-paganism. The Brotherhood’s former chief ideologist, Andrey Shedrin, moved through the apocalyptic Oprichnina Movement to the somewhat Traditionalist Brotherhood of St. Josef of Volotsk. Another former leader of the Brotherhood of Tsar Nikolai II, Vladimir Karpetz, later became a key figure in Alexander Dugin’s Eurasian Union of Youth. Read “The Brotherhood of Tsar Nikolai II and Russian Traditionalism” by Anton Shmakov. Must read for all who are interested in Dugin: Occasional paper #294 from the Woodrow Wilson Center, Marlene Laruelle's "Aleksandr Dugin: A Russian Version of the European Radical Right?" The paper may be downloaded in pdf from here or here. Found on Google: video of Julius Evola talking about his early experiences with Dada. 4 1/2 minutes, in French with Italian subtitles. First ten seconds is dreadful quality, but then it's fine. Alexander Dugin gets a mention in the October 4, 2006 L'Express. The mass-circulation French news magazine has a cover story on "Russia: The Spectre of Hate" (Russie : le spectre de la haine). L'Express mentions Dugin as the most notable of "number of ideologues close to power who are searching for a 'national idea.'" Dugin, of course, found his idea long ago, and it has little to do with either nationalism or hate. A question: why is the supporter of Dugin's former party (the National Bolsheviks) on the cover of L'Express giving the Nazi salute, not the National Bolshevik salute (which uses the clenched fist)? During his speech to the recent conference on Tradition in the Modern World (University of Alberta, September 23-24, 2006, 16 minutes), the Prince of Wales indicated what his favorite Traditionalist reading was. First and foremost came Sacred Web, to which he evidently subscribes. He also seems to read Sophia. 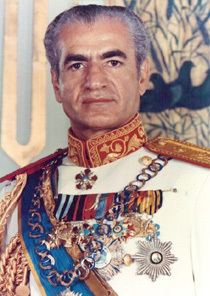 The writers he mentioned by name were Seyyed Hossein Nasr, Martin Lings, and René Guénon (for The Reign of Quantity). The Prince of Wales, then, is even better read in Traditionalism (in its Maryami version) than I thought (though it is interesting that he pronounces 'Guénon' in the English, rather than the French, way--with a w). His speech, like his reading, again made clear his admiration for those who offer us an alternative to the "disintegration" and "deracination" of "modernism," but did not otherwise clarify his own personal position. Since this is a moderated blog, comments come to me for review before they are published. Over the last few days, two people have attempted to leave comments on the "Traditionalism in Norway" posting which I have not published, because the comments had nothing to do with Traditionalism in Norway. "Sedgwick seems a devoted follower of the Western academic model of reductive empiricism," according to one of these two comments. Well, I suppose I could post something on "The Western academic model" and let people make comments there... but I don't really want to start a public discussion about myself on this blog. However, as always, anyone with anything interesting to say is welcome to email me directly: sedgwick@aucegypt.edu. Please note that I need to get an email directly in able to reply to it; the blog doesn't record the email of a person leaving a comment. The emphasis of most of my lectures will be on political Traditionalism, but in Bergen I will talk about Traditionalist Sufism. Sacred Web is organizing a major conference at the University of Alberta on September 23rd and 24th, 2006. The Prince of Wales will not be there in person, but will be spending a taped address. This promises to be a fascinating and important conference. I wish I could go myself... Others might like to check out the conference announcement, and if anyone feels like writing a short report (either for this blog or just for me) I would be most grateful. The Sixth Biennial Conference on Iranian Studies in London went well--dominated, as one might expect, by scholars from Iran or the Iranian diaspora. The interest there in my paper on "The International Ramifications of the Thought of Seyyed Hossein Nasr" showed to what extent interest him (and so in traditionalism) in Iran is still continuing to grow. (I'm now back in Cairo and will try to attend to this blog more often). Robert D. Crews has just published For Prophet and Tsar: Islam and Empire in Russia and Central Asia (Harvard, 480 pp, ISBN 0-674-02164-9, $29.95/£19.95). Mr Crews's research . . . is of huge relevance to the present day. . . From the state's point of view, there is a dilemma: how far can the compact with Orthodoxy go without precluding a similar one with the Russian Federation's 15m or so Muslim subjects? The idea of some entente between modern Russian nationalism and Russian Muslims is not as absurd as it seems. 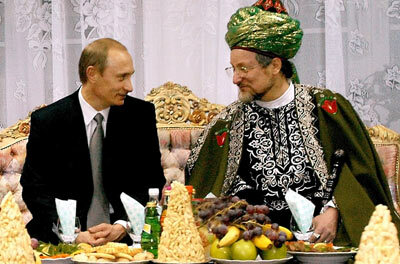 Among the ideologues of neo-nationalism in Russia, there have been several figures of Muslim-Tatar background who subscribe to the ideal of a Eurasian or "Slavic-Turkic" union—roughly coinciding with the Soviet Union—whose common enemy is global, or Anglo-Saxon, capitalism. I’m delighted that the Economist has noticed the importance of Eurasianism. But, to judge from the index at least, none of these important developments feature Dr Crews’s book. One of the organizers of the Sixth Biennial Conference on Iranian Studies asked me to contribute a paper on "The International Ramifications of the Thought of Seyyed Hossein Nasr," which I will be doing at SOAS in London on August 4. The panel is entitled "Influence of Iranian Religious Thought Outside Iran," and also features papers on "Ali Shariati in South Africa" and "(Still) Exporting The Iranian Revolution." Who is missing? Jamal al-Din al-Afghani, perhaps... Unusual company for Dr Nasr to keep, but in some ways appropriate. Traditionalists.org has just been relaunched with a new structure and a new look. The biggest change is that the contents of the Catalog of Contemporary Traditionalism are now available directly, without having to interrogate a database that was often not available for techncal reasons. Access to the database is still possible (if it is working!) via a Custom Search option. I would like to thank William Jon Hummel, my student assistant at AUC during Spring 2006, for all the effort and dedication he has put in to the new site, and also for updating the Catalog. This is the third incarnation of Traditionalists.org, which was first launched in June 2000. Or perhaps it is the fourth--the site started by accident when a paper I gave at a conference in Oslo in August 1998 was put on the web by the conference organizers, and I found that people were using the appendix to that paper as an internet guide to Traditionalism. That made me think that a proper site was needed, and gave rise to Traditionalists.org. The paper is still there, but a lot of other things have changed since 1998. 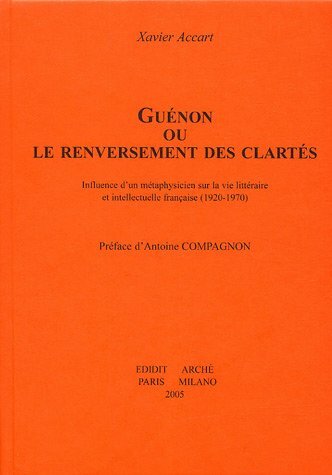 Xavier Accart has published Guénon ou le renversement des clartés : Influence d’un métaphysicien sur la vie littéraire et intellectuelle française (1920-1970) (Paris: Edidit; - Milan: Archè, 2005; 1222 p. ISBN: 2-912770-03-3). This study of the influence of René Guénon on French literary circles fills a gap in the history provided by my own Against the Modern World. Dr Accart noted this gap in his review of my book in ARIES (vol. 6, no. 1, 2006, pp. 98-105); he knows this subject better than anyone else, and the book (originally a PhD dissertation at the Ecole Pratique des Hautes Etudes, Paris) is strongly recommended. Queneau, Artaud, Gide, Paulhan, Daumal, Bosco, Drieu La Rochelle, Pauwels, Daniel Halévy, Léon Daudet, Jean Grenier, Simone Weil... autant d'écrivains qui lurent passionnément l'œuvre de René Guénon (1886-1951). La présente étude établit que l'initiateur de la pensée "traditionnelle" a exercé sur ses contemporains une influence beaucoup plus profonde et étendue qu'on ne l'avait d'abord cru ; elle tente d'expliquer ce phénomène paradoxal : comment une œuvre aussi étrangère au monde intellectuel de son temps a-t-elle pu le marquer à ce point. Loin d'être seulement due à sa critique de la modernité, l'audience de Guénon eut pour principal ressort sa vision de l'Universalité. D'une part, l'idée d'une connaissance suprarationnelle marqua profondément de jeunes écrivains, las du divorce entre les mots et les choses et assoiffés d'expérience. D'autre part, la présentation des doctrines spirituelles de l'Inde et de l'Islam, ainsi que l'affirmation de leur identité foncière avec celle du christianisme, ont fait apparaître ce métaphysicien comme un passeur entre les mondes, un artisan de paix entre des peuples qui se haïssaient faute de se connaître. éditoriale, de ses années parisiennes à sa retraite du Caire. Sufism in the Arts-without Traditionalism! Sufism has again made a high-profile appearance in the mainstream Western arts, following on Sir John Tavener's 2004 The Veil of the Temple. Tavener is a Traditionalist, but this time there is no discernable Traditionalist input. Director Peter Brook, famous for Marat/Sade, is considered something of a disciple of Gurdjieff, not of Guénon. 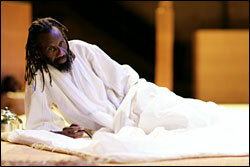 Brook put on his play Tierno Bokar in New York in 2005. Tierno (or Cerno) Bokar (c.1883-1940) was a Tijani shaykh in Mali, and has been the subject of both a literary/documentary biograhy (Amadou Hampaté Bâ, Vie et enseignement de Tierno Bokar: le sage de Bandiagara, Paris: Seuil, 1980) and a scholarly work (Louis Brenner, West African Sufi: The Religious Heritage and Spiritual Search of Cerno Bokar Saalif Taal, London: C. Hurst, 1984; an extract from Brenner's book is available here). Brook describes his play as bieng about a theme that is much more modern than Traditionalist: "the question that concerns us all—the power of violence and the true nature of a tolerance that is more powerful still" (Brook's comment). Wikipedia seems now to have become the world’s most-used source of information,(1) so it is interesting to note that René Guénon currently features in some 400 Wikipedia articles in 21 different languages. Predictably, it is the English verison of Wikipedia (which is the largest) that has most references to Guénon. The French and Turkish versions also refer to him a lot. With the exception of Japanese, every major version of Wikipedia(2) mentions him at least once, and usually several times. Guénon also features in 8 of the smaller Wikipedias, especially Croatian, Hungarian, Romanian, and Russian. (3) I have not been able to find entries for him, however, in Arabic or Chinese, or in a number of other minor versions of Wikipedia. (4) Guénon does appear, however, in three very small versions of Wikipedia: those in Sicilian, Uzbek, and Vietnamese. Guénon’s popularity in Sicily has already been noted. The Uzbek and Vietnamese mentions remain to be explained. (1) Alexa.com now ranks Wikipedia 16th in its traffic rankings. Wikipedia probably actually ranks higher, since Alexa admits to over-counting Chinese sites. Excluding Chinese sites, Wikipedia ranks 9th. All the eight more popular sites are search engines, networking sites (MySpace) technical sites belonging to Microsoft, or sales sites (Ebay and Amazon). (2) In addition to English and French, these are: Dutch, German, Italian, Polish, Portuguese, Spanish and Swedish. (3) The others are: Greek, Estonian, Malay, and Norwegian. (4) Bulgarian, Czech, Danish, Finnish, Hebrew, Icelandic, Indonesian, Korean, Lithuanian, Persian, Slovak, Slovenian, Serbian, Thai, and Ukrainian. Nor does Guénon feature in Basque, Catalan, Galician, Esperanto, or Neapolitan. Those in or near Europe doing research on Traditionalism may be interested by the European Society for the Study of Western Esotericism (ESSWE). The ESSWE website lists scholars, books and so on in 28 categories, and one of these is "Traditionalism" (along with, for example, "Neoplatonism"). ESSWE's inaugural conference will be in Germany in July 2007, under the title "Constructing Tradition: Means and Myths of Transmission in Western Esotericism." There may be some papers on Traditionalism. I am currently working on my thesis, writing a dissertation under the direction of Dr. Antoine Faivre of the Ecole Pratique des Hautes Etudes (Paris, France). The topic of my dissertation is perennialism in intellectual circles in the U.S. in the late 20th centruy-early 21st century ("La présence du courant pérennialiste dans les milieux intellectuels aux Etats-Unis dans la seconde moitié du XXe et le début du XXIe siècles"). I have no previous publication on this subject. My previous publications are a book on Nietzsche, and book translations from French to Farsi, e.g. Merleau Ponty Eloge de la philosophie and Sarah Kofman Caméra Obscura de l'Idéologie. Jean-Pierre Laurant is the doyen of French scholars working on Traditionalism, and has just published an important new book on Guénon. René Guénon, dont la destinée et l'œuvre sont singuliers - intellectuel catholique, il est mort musulman au Caire en 1951 -, s'est insurgé toute sa vie contre l'évolution de la civilisation occidentale. Considérant que celle-ci était pervertie par un mauvais usage de la raison, il a plaidé avec force et conviction pour un retour à la Tradition originelle, telle qu'on peut encore la voir « vivante » dans d'autres civilisations. Beaucoup de ceux pour qui la lecture de ses œuvres a été un choc décisif ont cherché depuis l'issue dans les voies initiatiques indiquées comme possibles par René Guénon : l'église catholique, la franc-maçonnerie, l'islam soufi ou le bouddhisme. À travers ces itinéraires, celui de Guénon et celui de ses lecteurs-cherchants, est reposée la question essentielle de la place, à l'échelle mondiale, du spirituel dans nos sociétés matérialistes. After publishing Against the Modern World I started posting occasional addenda to the book. There are now so many of these that the time has come to embrace one aspect of the modern world: the Blog. So, here it is: a Blog on the Traditionalists, where I will post, from time to time, any news (current or historical) that comes my may that is interesting and relevant, and where others too may post comments and news (which I will moderate). But as we're rearranging the site, there will be no new posts for a short while.